The most keenly awaited entry in Fabric's mix series for a while is finally here. It's over a year since Karl 'Regis' O'Connor, Dave 'Function' Sumner, John 'Silent Servant' Mendez and Peter 'Female' Sutton called time on their Sandwell District collective and label, but Function and Regis continue to use the name for their DJ/live incarnation - and it's the sound of that battle-hardened tag-team which is captured on Fabric69, a 30-track rinse-out of high-torque techno broadcast from their bunker in Berlin. The first half of the disc feels like it belongs to Regis: his deft edits are the star of the show, and he doesn't so much play tracks as sample and recombine them into custom dancefloor alloys: so it is that Raime's 'Exist In The Repeat of Practice', Boyd Rice & Frank Tovey's 'Extraction 7' and Regis's own remix of VCMG's 'Spock' are smelted down to form one long, lithe dark garage steppa that holds you by the throat for 15+ minutes. The live feel is reinforced by further favouring of his own productions, including snake-hipped versions of Ike Yard and Vatican Shadow and the slamming, shapeshifting CUB track 'CU2'. Before long we've settled into the brawny, flexing, dub-touched warehouse sound that Sandwell do so well, and Function pushes things further into tracky and even trancey 4/4 territory with Mary Velo's 'Detune' and the cybergothic drama of Carl Craig's 'Darkness'. 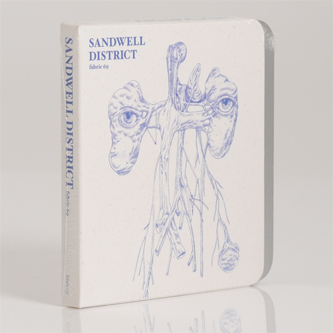 Sandwell members, friends and affiliates all contribute to the tracklist: not just the aforementioned BEB and Frozen Border gear but also cuts rom Rrose, James Ruskin, Surgeon and Silent Servant; there are nods to the new-school (Samuel Kerridge, Factory Floor, Untold) as well as the old guard (Laurent Garnier, Mark Ernestus, Planetary Assault Systems), and the mysterious SS/S's 'Sicario de Dios' updates the hundred-hand-slap of a late 90s Downwards cut marvellously. Like the whole mix, it's punishing, hypnotic and effortlessly stylish.